Exploring is the young adult career education program designed for men and women ages 14 through 21. Law Enforcement Exploring is a youth oriented program, active in police agencies throughout the nation, that provides young men and women the opportunity to learn about the various careers in law enforcement by offering them actual experience and training. Explorers can take part in crime prevention activities, community policing, traffic control, ride-alongs, patrol procedures, disaster assistance, civic events, and many administrative duties within the police department. 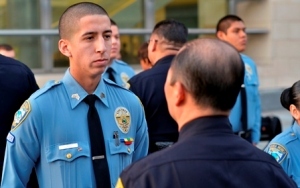 Law Enforcement Exploring is a hands-on career discovery program. Some program highlights include National Law Enforcement exploring Leadership Academies, Career Achievement awards, and scholarship opportunities. After acceptance into the program, initial training takes place at the South Bay Regional Law Enforcement Explorer Academy. You are required to successfully complete the academy in order to become a member of the Explorer Post. The academy consists of twelve consecutive Saturdays and includes over 120 hours of instruction. Explorers meet every Monday evening from 5:00 - 7:00 pm. Meetings are held at the Public Safety Facility (333 Olympic Dr., Santa Monica, CA 90401). Please call 310-434-2627 to verify there is a meeting scheduled before attending. For additional information you may contact Explorer Advisor Suzie Lockwood at 310-434-2627. *While Police Explorers are considered volunteers, they are completely insured while in training and on duty.